Rumors regarding Samsung's plans to bring a foldable smartphone to market have circulated relentlessly over the last few years, and thanks to some leaked images that have just surfaced on Twitter (and then posted on SlashLeaks), we now have an idea of what that dual screen concept might've looked like. Looking like a pair of Galaxy Note 5 handsets attached by a hinge when viewed front on, the foldable device has been dubbed 'Project V' and is believed to be from 2015-2016 based on its SM-G929F model number, which puts it in the same group as the Galaxy S6 Edge (SM-G925x) and Galaxy S7 (SM-G930x). The keen-eyed among you might also notice the old Play Store icon featured on the phone's display. 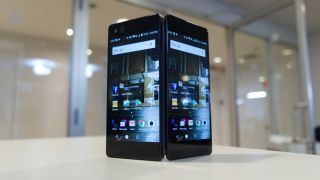 Far from the flexible display that most of us imagine when the words 'foldable phone' appear before us, the device features a clamshell design with two separate screens that appear to show two home screen pages simultaneously when flipped open. We can also surmise from the images above that the bulk of the phone's internals can be found in the thicker half of the device, while the thinner half is just a secondary display that can be flipped out from the back when needed. In theory, the tech behind this wouldn't be too hard to achieve, so we have to assume that Samsung did not move forward with this concept because of how utterly ghastly it looks. Still, it appears that Samsung is not entirely done exploring this particular smartphone layout, with some leaked patents from earlier in the year showing this foldable dual screen concept to be alive and well.